I was encouraged to try CrossFit by an Ultimate Frisbee teammate. When she bragged about a workout she had done the day prior that included one hundred pull-ups, I didn’t believe her. I was curious. In January of 2010 Mike Jones coached my intro classes and at the end I did Fran (21-15-9 reps of thrusters and pull-ups). What an eye opener! Having been a marathon runner I was shocked at how winded I was. After trolling the Internet and discovering how fast athletes could complete Fran, I was hooked. Challenge accepted. I CrossFit because… of the physical and mental challenges it gives me. Every day at CrossFit is a new adventure. As a runner I was constantly worried about my body weight and putting in the miles. Today, I only worry about getting stronger. Some days I am the first to get done with the workout and other days I am the last. Regardless, the community at CrossFit St. Paul is always supportive. 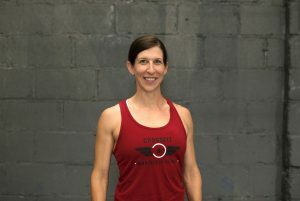 I coach because… CrossFit provided a service that changed my views about going to the gym. I see athletes walk in the door and they are excited to work out. I get the opportunity to be part of their day. Watching athletes hit personal records, learn a new skill, and achieving their goals is very rewarding as a coach. Each member has different strengths and weaknesses; guiding them challenges me as a coach. I coach because I want athletes to feel comfortable in the gym and safe when performing new movements.